Please remember to have a safety plan in the event of severe weather. Storm damage is rarely isolated to just a few buildings in an area adding the challenge of finding a restoration company that can quickly respond swiftly to your needs to an already difficult situation. SERVPRO of Limestone and Lawrence Counties will deliver the help that you need when you need it. Call us today (256) 233-4033. We are here for you 24 hours a day 7 days a week. Let us come help get your home back to preloss condition. Here is a picture of mold that was found in a closet in a home. The homeowner was cleaning out the closet and found this behind some boxes. Humidity levels in your home that are too high can promote mold growth. 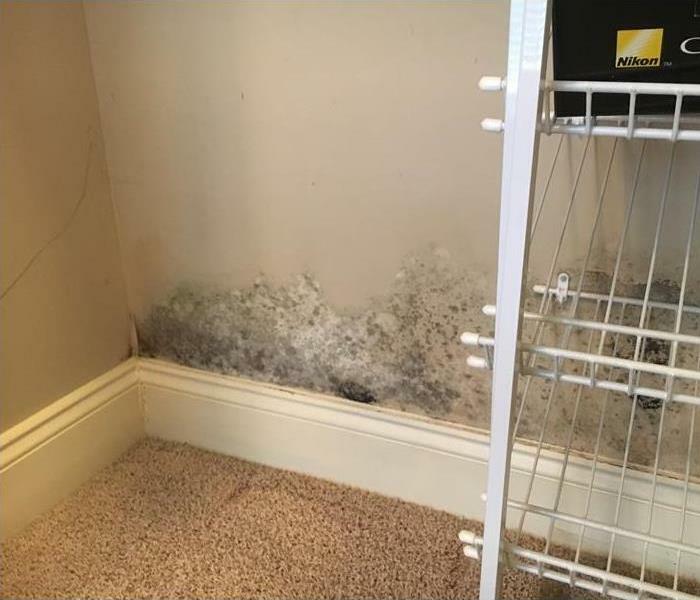 Mold grows quickly in damp conditions. Allergens and irritants are released as it spreads, and in some cases it can become toxic. 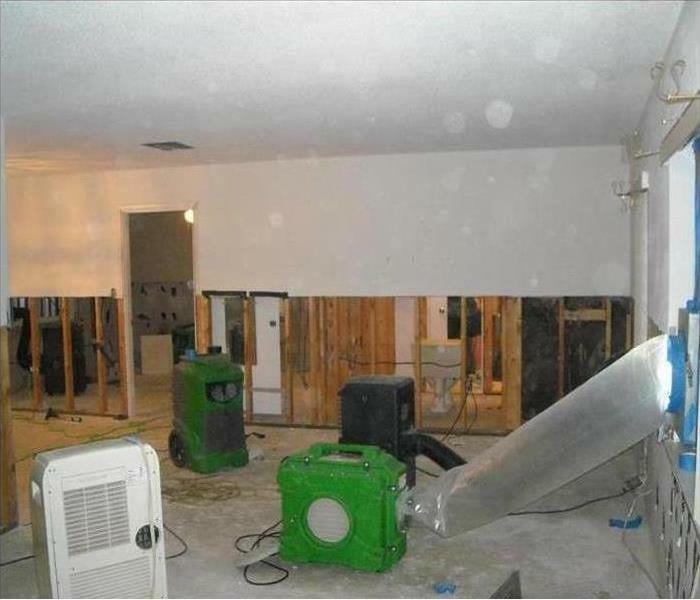 To prevent this, you can install dehumidifiers in areas of your home that remain moist and humid. Optimal humidity levels are between 30-50%, with 45% being the best level possible. Dehumidifiers help maintain your indoor humidity at a comfortable level. Making sure that your HVAC system is running efficiently will also help to keep your humidity level down in your home. Inspect and replace your filters on a regular basis and keep vents cleaned. Limestone and Lawrence County homes are usually storm resistant. People here are used to the wind and rain and act accordingly to protect their roofs, walls, and floors. 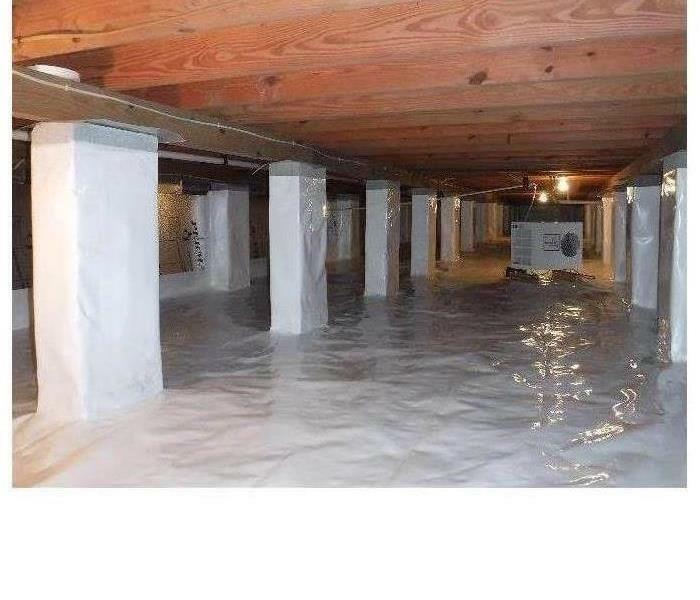 It is more challenging to protect basements and crawlspaces from the same water, however. To dry out a wet crawlspace, we first have to remove the water. That is not usually a problem, but since this is a storm, the ground is going to be very wet and possibly damaged. SERVPRO technicians understand that means multiple, water-filled low spots. It can be difficult to bring in hoses even in a large crawl space to siphon out the pooling water. The next step is to lower the humidity as much as possible. Bringing in a dehumidifier is not usually an option, just like pump hoses. We can set up dehumidifiers with flexible plastic conduits to direct the moist air from the space to the exterior. We can also place containers with chemical desiccants in the crawlspace to absorb water from the air. If possible, we set up an air mover above the crawlspace and blow in warm, dry air to displace the damp air we attempt to draw out using an exhaust fan. Now that we removed the water, SERVPRO technicians encapsulate the crawlspace once the moisture level and soil dampness have been reduced to normal levels. We cover the dirt floor with polyethylene sheets and a polyester mesh for reinforcement. This 12 mil plastic guard covering prevents moisture from leeching up from the ground. Next, our technicians check the walls for cracks or seeps caused by the storm. Technicians can fill weaknesses with hydraulic cement and then cover the walls with masonry cement. These two compounds form an excellent seal against further water intrusion. Now that the walls are secure, we seal the polyethylene sheets and polyester mesh floor to them with waterproof, foundation tape. Finally, to protect against further storms, we recommend applying a thick coat of liquid rubber to the outside of the foundation. Once it sets, the only way storm water can get through is for a storm to crack the foundation or shift it underneath the home. Drying out a wet crawlspace is not an easy task. It takes a professional service to remove the water and prevent further intrusion from future storms. To see how we can protect your home, call SERVPRO of Limestone and Lawrence Counties at (256) 233-4033 today. We are here to help. 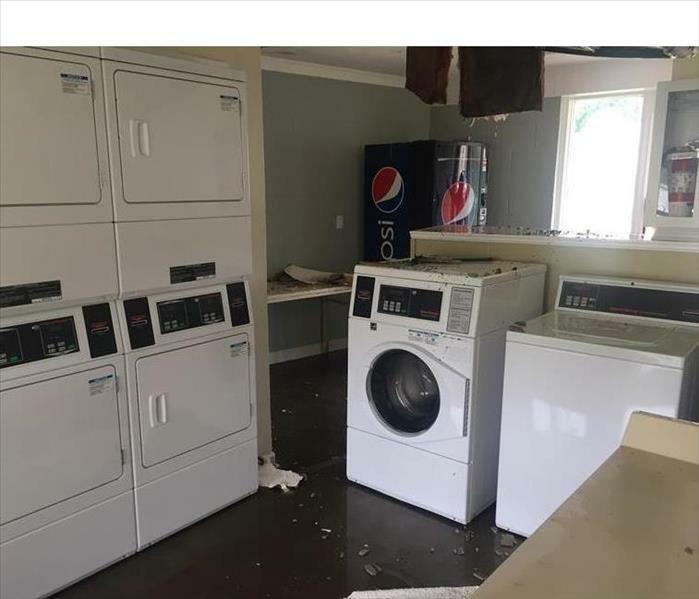 This is a photo of a laundry room at an apartment complex. They had roof damage and the tarp did not hold so water flooded the room. The longer water spreads through your building, the more damage it causes-especially as it becomes more contaminated over time. Prolonged periods of moisture in your business can also lead to mold problems. We are committed to the phrase, "Faster to any sized disaster". With our 24/7 service, we are able to contain and treat water damage quickly, which allows us to save and restore as much of you building and property as possible. At SERVPRO, we prefer to restore before we replace. Restoring saves money and gets the business back up and running faster. Our technicians are highly trained and are available to help at any time. If you have water damage in your business, do not wait, call us today at (256) 233-4033. Let us make it "Like it never even happened." If your area is expecting a tornado or other major storm, there are several steps you can take to stay safe. After the tornado passes, SERVPRO can help you clean up any damage and restore your home. Local television and radio stations are your best source for updates on how the storm is developing. However, if you hear a tornado siren, you should immediately head to the nearest shelter. What is the Difference between a Tornado Watch, Warning and Emergency? * A Tornado Watch means that a storm could be coming in your area soon because of the current weather conditions. * A Tornado Warning is a sign that one or more tornadoes are in the immediate area. Look for shelter as soon as you see this signal. • A Tornado Emergency is the final step in the warning process. 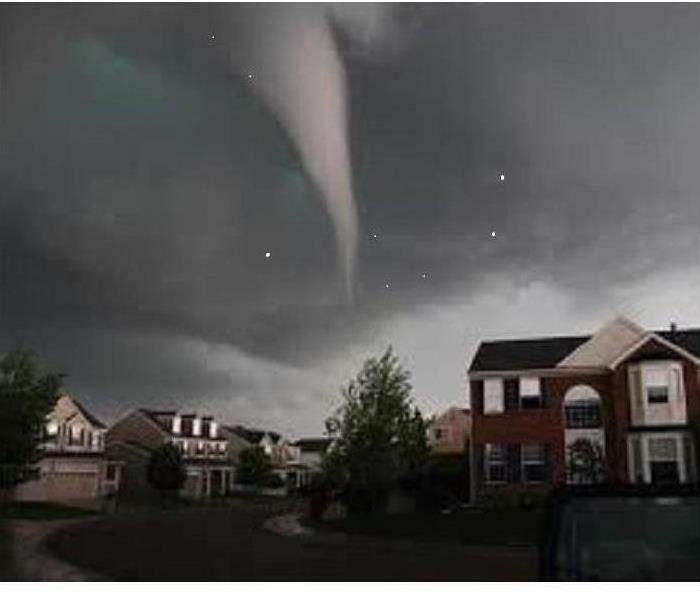 A tornado has been spotted near a populated location. Move to the safest possible place if you cannot get to a real shelter in time. Head for a sturdy building before the storm approaches. Look for a home or office with a basement whenever possible. If a basement is not available, move to the center of the building. Stay away from windows and debris. Try to place as many solid walls as you can between the coming storm and your family. Avoid mobile homes and trailers during strong winds or heavy rains. Cars also do not provide much shelter. If the storm is too severe for driving, secure your seat belt, get as low in the seat as possible and place a blanket over yourself. Stay close to the ground if you are caught in an open field. Cover your head and keep an eye out for debris flying through the air. Avoid hiding under overpasses or bridges. SERVPRO of Limestone and Lawrence Counties is locally owned and operated, so we are part of this community too. When you have a flooding or storm emergency, we’re already nearby and ready to help. We take pride in being a part of the community and want to do our part in making it the best it can be. 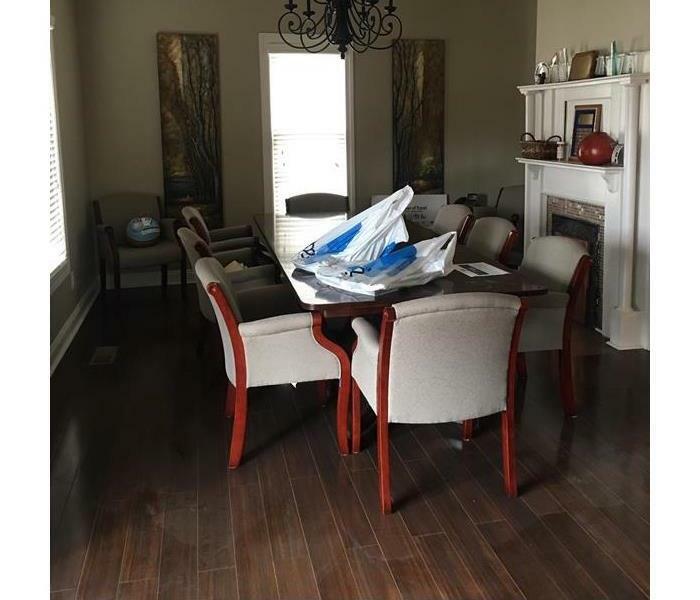 Along with our restoration services, SERVPRO of Limestone and Lawrence Counties provides a variety of cleaning services. One of the services we provide is Post-Construction Cleaning. After restoring and rebuilding your property, there is still work to be done. It is important to get your property properly cleaned and ready to re-open. Let SERVPRO of Limestone and Lawrence Counties help. There is no job to big or too small. Both interior and exterior cleaning is needed after a remodel or new construction. When considering cleaning services please keep in mind that all walls, ceilings, floors, and fixtures will most likely need to be cleaned. Construction causes dust that gets on every surface. It is also very important to make sure you do not have duct in your heating and cooling unit. If you are needing a quote for a post-construction clean, give us a call at (256) 233-4033. Cleaning up a commercial building after soot affected the entire building from construction. This was another big commercial post construction cleaning. A fireplace was removed from one of the rooms downstairs which caused soot to cover all of the surfaces in this business. Cleaning of both the interior and exterior is typically needed after a remodel or new construction. All trash and plastic containment removed. Fire in 1 hotel room that affected not only that room but others. 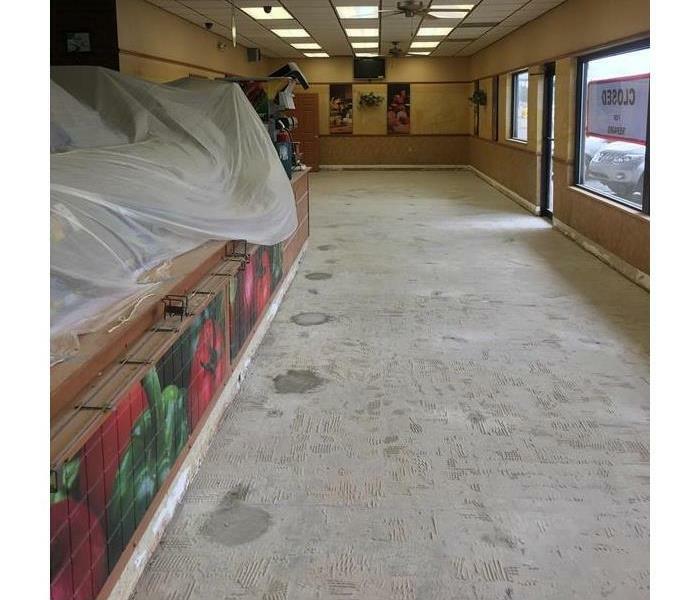 SERVPRO of Limestone and Lawrence Counties can help if you have had a fire at your business. 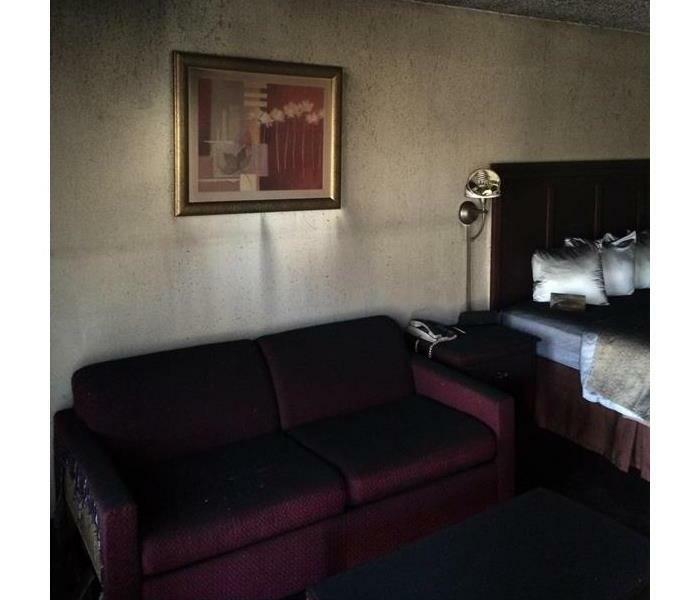 This is a photo of a fire that happened in a hotel room. Not only was there fire damage but the entire room was affected by the smoke. Smoke damage can be very detrimental if not properly cleaned. Fires can be very a stressful time for you and your business. Let SERVPRO of Limestone and Lawrence Counties help. With our industry approved training, rapid response, professionalism, cutting-edge technology, and open communication, we strive to restore not only your business but your peace of mind. SERVPRO of Limestone and Lawrence Counties will make it "Like it never even happened." If you have had a disaster at your business call us at (256) 233-4033.